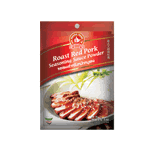 This barbecued Chinese pork recipe seasoning gives the pork a sweet shiny glaze and delicious taste. Take a stroll through any Chinatown in the world and you’re bound to see restaurants with strips of red char siu hanging from hooks in the windows. Char siu literally means “fork burned” which is a reference to the traditional preparation, skewered and barbecued over a fire.